It’s been said many times that a good live album is a rare thing. Slaid Cleaves‘ first official foray into the territory is a successful one though. Recorded over two sessions at Austin’s Horseshoe Lounge, as immortalised in its own song on Slaid’s ‘breakthrough’ record Broke Down, the backing is simple. Typically subtle lead guitar and vocals from Michael O’Connor, with further vocals plus accordion, harmonica and trumpet played by Oliver Steck. Live Cleaves always comes across as warm and humble, and that is captured perfectly here. The 21 tracks of this double CD serve almost as a retrospective of sorts, taking in songs mainly from his three previous albums of original material back to the afore mentioned Broke Down. The only exceptions to that being new song Go For The Gold which is tipped to make his next CD, No Angel Knows (from the album of the same name) and as has become tradition in Slaid’s live sets, a couple of yodeling songs by the late Don Walser. Aficionados could also make an argument for Key Chain to be included in those exceptions. But we haven’t mentioned the ‘hidden’ track either. As you’d expect there are many of the live favourites here, the audience participation led Breakfast In Hell, Lydia; a perfect example of Cleaves making somebody elses song his own, and Horses. Though sadly one thing the CD omits are any of Slaid’s spoken stories of Willy, the subject of Horses. On a similar theme the only song i can say i miss from the album is the Seabiscuit tale Quick As Dreams, often performed ‘off mic’ though understandably difficult to reproduce here. 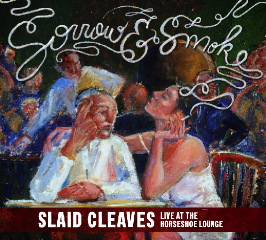 All in all Sorrow & Smoke provides a near perfect document of the Slaid Cleaves live experience, and for new fans offers a great introduction to his material. As all good live albums should do, it leaves you wanting to have been there, and looking out for the next time he’ll be in your town.